CrankCase™ Security Rack. Best in class. CrankCase™ captures the left crankarm and seals off its connection to the bottom bracket. Since you need access to both sides of the bottom bracket to disassemble it from the rest of the bike, you've captured the bike without contacting any part of the painted frame. CrankCase allows you to easily secure the front wheel (attached chain) and rear wheel (integrated shaft). Whether you have a simple padlock or one of the many different types of U-locks, CrankCase's receptacle shields your lock. 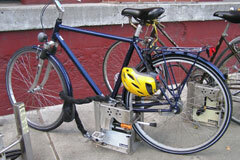 And it does all this while leaving your bike in an upright, organized position. 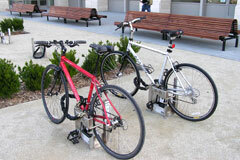 Bicycle security racks are commonly classified as "Type 2 Racks" or "Class 2 Racks" in building codes and municipal bike programs. A Type 2 Rack is loosely defined as one which captures the bike's frame and at least one wheel, and provides some form of lock protection. If you are looking to fulfill such a requirement, beware. A number of manufacturers cynically alter a single bend rack by attaching a two dollar cable (for wheel) and maybe drilling a hole through the pipe (for U-lock insertion), and then call this a "Type 2 Rack". It may be attractive price-wise, but it is NOT what was intended, and does not provide any additional security. Considering more than a basic rack? 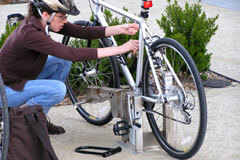 CrankCase™, by far, is the finest bicycle security rack. Don't let its compact design deceive. 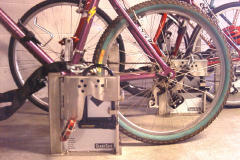 CrankCase redundantly locks down your bike like a Denver Boot!